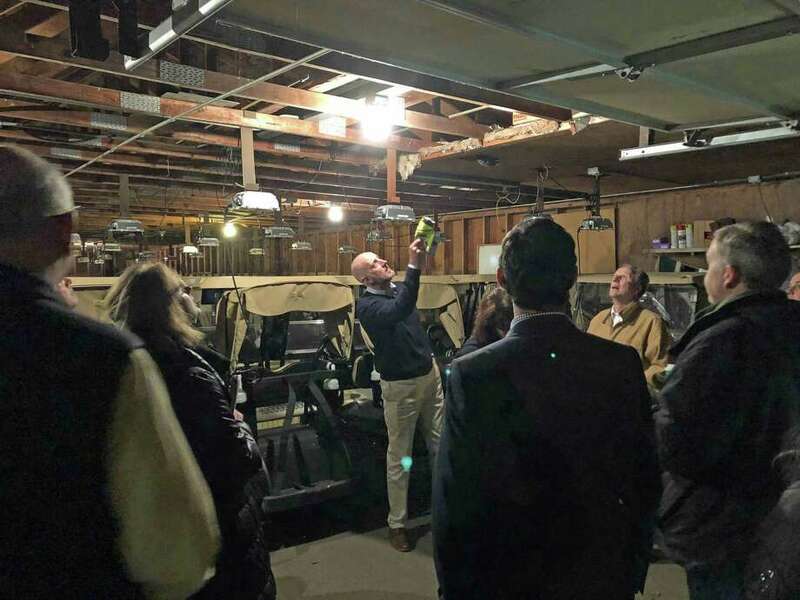 FAIRFIELD — It was the first time, Board of Finance members said, they had met at the golf clubhouse bar. And it might be the last time if the project and funding to rebuild the H. Smith Richardson Clubhouse, overseen by the similarly named building committee, get approved by town bodies in the coming weeks. The building committee, chaired by Craig Curley, gave the finance board members a tour of the premises at their Nov. 27 quarterly review meeting, highlighting key deficiencies in the premises. There are also problems with the plumbing, particularly in the locker room. According to the building committee’s presentation, the initial cost estimate of the project was $7.1 million, but a schematic design estimate drove that up to $8.9 million. Following a value-engineering session, the final cost estimate was brought down to $7.6 million. Board of Finance members peppered the building committee chair and Vice Chair Hal Schwartz with questions, notably about the absence of key factors like professional services, soft costs and contingencies that were not accounted for in the original 2008 estimates when the project was assessed in the town’s long-range capital plan. The presentation also noted the original 2008 plans accounted for a 7,659 square foot building — the current schematic is now at 9,500, a factor that adds to building costs. Board of Finance Chairman Tom Flynn countered, saying previous estimates did not include costs for professional services and contingencies. In the next two weeks, the building committee will present to three town bodies: the Board of Selectmen, the Board of Finance and the Representative Town Meeting. These bodies are scheduled to act and vote on the funding request by January, according to the presentation. Any one body can turn the project down, which could cause the committee to modify or reshape the proposal, and starting the process all over again. According to the presentation, if all town bodies approve the funding request, bids would go out by the second quarter of fiscal year 2019 and a target opening date would fall on Labor Day of 2020. The building committee gave an update earlier in May when they were considering three options for the clubhouse: renovation, rebuilding on the current spot or moving the clubhouse near the driving range. The committee reviewed the options and opted to rebuild the structure.